Eating right means eating food from right here at home. When it comes to the milk you drink here in California, make sure it’s local. Up to 20% of the milk in California grocery stores is actually produced out of state! Only the Real California Milk seal certifies that the milk you’re buying is the real deal: 100% Grade A milk, sourced exclusively from dairy farms here in the Golden State. If it doesn’t carry the seal, it could be coming from anywhere. Please support our local dairy families and look for the seal. If it’s not on the milk in your local grocery store, tell the store manager you want your milk certified local. Many local independent grocery stores also carry milk with the seal. Research shows that consumers across the country have an affinity for California foods, from raisins and avocados and almonds to wine and cheese. More and more, consumers care where their food comes from and look for the value in California foods. We’ve taken our incredible success of marketing California cheese and expanded it to the whole range of dairy products made with California milk. 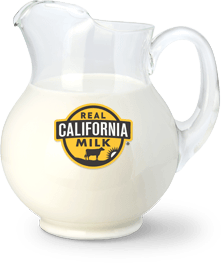 From butter to ice cream and everything in between, every time consumers see the Real California Milk seal, they know that product is made with 100% Real California Milk from one of California’s more than 1,300 dairy families.